Say what you want about Kanye, but this guy sure knows what he's doing when it comes to attracting attention. Yesterday afternoon, Yeezy Season 3 took over the fashion and the social media world by storm. Fans (and probably the haters too) watched the highly-anticipated fashion presentation and album release party from Tidal's crashing site, local movie theaters, or live at MSG. The collection is definitely an improvement from Kanye's last two seasons. 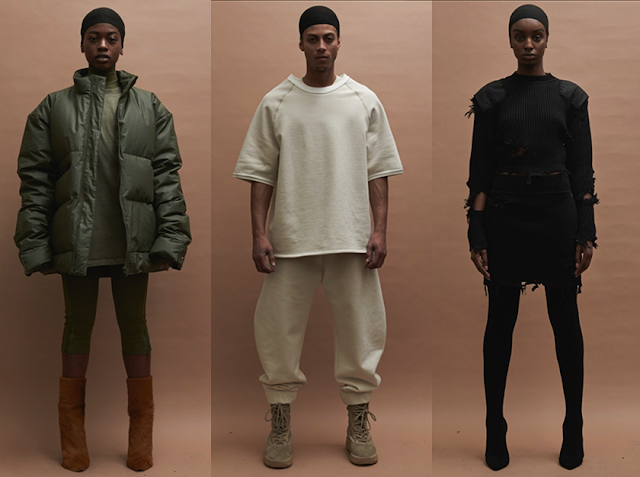 Yeezy Season 3 had more wearable, colorful, and stylish pieces unlike his post-apocalyptic S1 and S2 collections. The presentation showcased high-fashion(ish) and streetwear styles — consisting of distressed fabrics, bubble jackets, and Kanye's signature monotone bodysuits. The rapper/aspiring fashion mogul hinted that the new season might be more affordable for his loyal fans on a budget and if this is true, Kanye might just have a fashion hit on his hands. But the big questions is ... what's affordable in Yeezus' eyes?? Definitely different from other styles on the runway but a big improvement for Kanye!